Beteasy is an Australian online bookmaker, acquired by William Hill when it entered the Australian gambling market several years ago. The bookmaker stands out with relatively high coefficients, an impressive bonus and a broad list of events, which can be clearly seen from the 47 categories available for betting on their site. Beteasy esports betting site has a single language version in English. Today, only bettors from Australia and New Zealand are allowed place a bet in esports. In March 2018, the online betting giant William Hill ended its interest in the Australian gambling market and merged with CrownBet to form Beteasy. The new esports betting site is licensed in the northern territory of Australia. 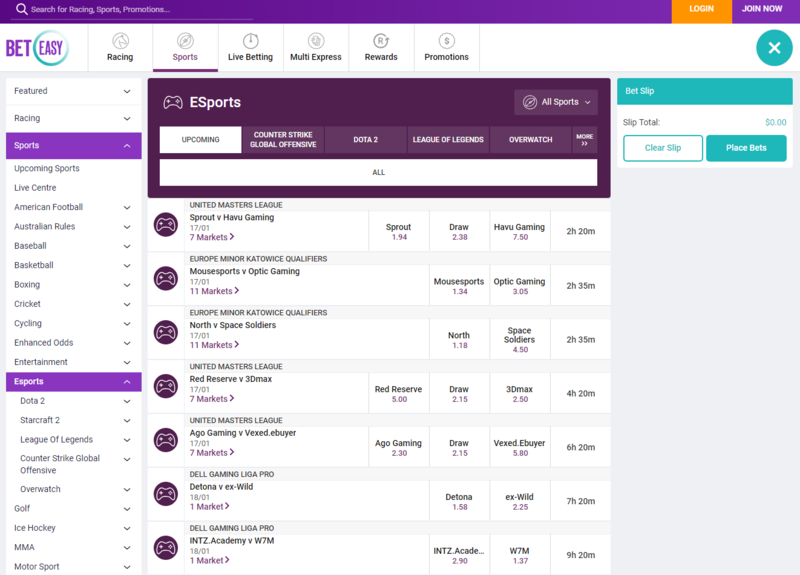 Although the parent companies of Beteasy are professional behemoths in online betting, how suitable is the newborn bookmaker for esports betting fans? It is advisable for any beginner to go through many Beteasy reviews before finally deciding to register and deposit with Beteasy. In our review of the bookmaker, we have compared its services on the basis of many important criteria including its range of esports, welcome bonus, and odds, supported payment methods, web and mobile interface, customer service and of course, its reliability. The bookmaker mainly provides sports betting in horse racing, tennis, volleyball, NBA, NFL, cricket and hockey. From the first impression, it seemed Beteasy is not focused on esports. In fact, there is no trace of the word esports on their homepage. However, you can visit the esports section by clicking on the sports button on top of the homepage. Place your bet on four of the most popular esports including DOTA2, League of Legends, Starcraft 2 and Counter Strike GO. Beteasy allows you to place several types of bets on your favourite esports. You can choose to wager on the winning team of a single round or an entire match or tournament. It is also possible to bet your money on the team to score the First Kill or the First Tower, First Baron, First Dragon, etc. There are a variety of events covered, but there are not many opportunities for you to find high odds in the esports segment. Beteasy is not very convincing when it comes to the variety in esports and chances of better odds. A lot of promotions are devoted to racing. You will also earn bonus bets on horse racing and sports. Again, there is not much the Beteasy is promoting or awarding to its esports customers. However, as a welcome bonus, new customers can enjoy a 100% bonus bet (max $100) on their first deposit after registration. The bonus bet is eligible for maximum 7 days, and it must be turned over at odds of $1.50+. Also, customers will benefit from their Beteasy loyalty program. By registering an account with the bookmaker, they get the opportunity to accumulate points and exchange them for movie tickets, footy tickets, and gift cards. It would be of no use if you cannot make a deposit after sign up on a bookmaker site. You can open an account in Beteasy only in Australian and New Zealand dollars. Other than the traditional MasterCard and VISA cards, you can use PayPal to deposit your money at Beteasy. Not many bookmakers can provide the PayPal facility, and if this one does, we can be sure about its reliability with payments. The minimum amount of deposit through credit cards and e-wallets is 5 AUD and 30 AUD respectively. Using electronic wallets is in favour of the esports bettor as the deposits are instantly available and there is no commission either. You can withdraw your winnings using the same methods. However, withdrawal can take up to three business days to process. There are no limits for withdrawal. To access your winnings instantly, the bookmaker provides you with your Beteasy Prepaid card. Use this card to spend your winnings at any online or offline store accepting VISA. The Beteasy Australia website is made in the original lilac tones with turquoise. Navigation is convenient, and the interface is quite simple to be honest, even for those who do not know English. This bookmaker has high-quality mobile applications for both Android and iOS. You can easily find the download links that are listed in the lower right corner of their website. On the mobile, what you get is a functional application that allows you to perform the same operations as from the desktop site, but much faster and with lesser traffic. The company provides support for their customers 24 hours a day, 7 days a week. Although the support is available only in English language, Beteasy has provided a lot of options to reach its representatives. To begin with, you can send them a mail and discuss your queries in details. For urgent queries, you can call them on their hotline at 13 2769. There is also a live chat feature which is something to appreciate as it hints us that the company is willing to reach its customers and help them. You can find answers to some of the basic questions in the FAQ section and the How To – Videos. 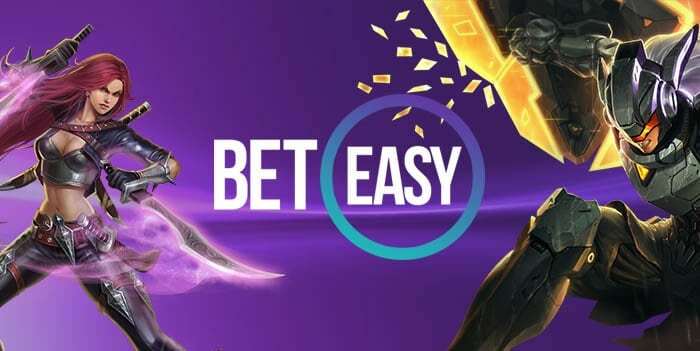 Beteasy Australia does not offer the most profitable odds, and neither does it list a whole lot of esports games like World of Tanks and Heroes of the Storm. However, from our expert review on the bookmaker, we can conclude that it is a reliable esports betting site with an easy-to-use interface, decent welcome bonus, and excellent customer support. We can only hope that in the future, Beteasy will provide odds for other popular esports title and cover major esports events.